We are looking for three new people to join the MDS team. We are based in Peterborough, Cambridgeshire and are a small and friendly team. If you are interested in working for a not for profit doing exciting work to develop talent for the food & fresh produce industry then take a look at the roles available here. MDS are delighted to announce that they have signed the Agrespect pledge, promoting diversity in farming communities. We fully support Agrespect’s mission and belief that people live their best lives when they live authentically. Agrespect aims to promote diversity in rural communities and to share LGBTQ+ people’s stories, to demonstrate that being different should be celebrated and should not be a barrier to living and working in the countryside. MDS works to supply food and fresh produce industry with young talent and we are proud to recruit graduates from a variety of backgrounds to increase diversity in the industry; those originally from a farming background as well as city-dwellers, varying ethnicities, religions, sexualities and academic backgrounds. We are therefore actively working with the belief that the industry needs diversity to continue to grow, and in today’s very challenging environment makes this need even more urgent. To find out more about Agrespect, including other organisations that have signed the pledge, visit: https://agrespect.com/. There has never been a more exciting time to get involved in MDS. Over the last two years, MDS has been working to increase the number of trainees it recruits, as well as to fine tune its training programme, ensuring that trainees receive an accredited qualification at the end of the two year programme. To this end, MDS has forged a partnership with Quantet Group to convert the programme into an apprenticeship, providing a more attractive offering to trainees and members alike. We are pleased to announce that from the autumn, the training programme will become a Level 5 Leadership and Management apprenticeship, accredited by the Chartered Management Institute. The additional benefit of this is that MDS members will be able to put their own staff through the MDS training programme using their levy. The changes will also enable MDS to fund trainees’ off the job training either by members passing down up to 10% of their unused levy or by co-government funding. This will ensure that costs for training MDS trainees are kept to a minimum. The programme is exclusive to MDS and its members and is ideal for employees showing leadership potential. 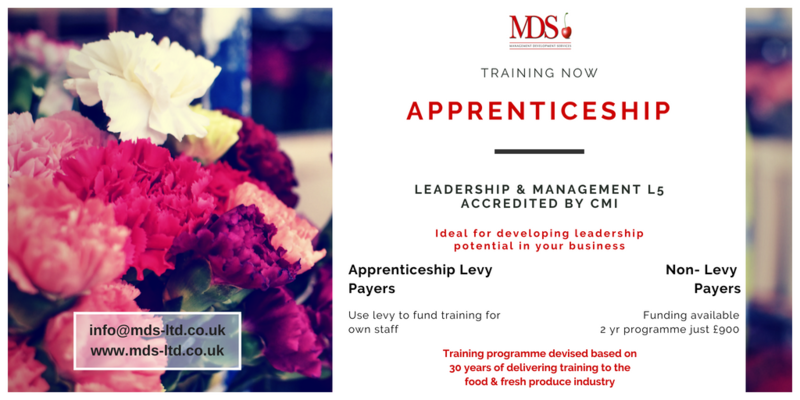 The partnership between MDS and the Quantet Group has gone a step further than the minimum standard for this qualification, as the programme covers both the requirements for the Level 5 Operations/Departmental Apprenticeship Standard plus five additional sessions to deliver skills specifically for the food & fresh produce sector. This would usually only be offered at a significant additional cost above the levy, but MDS together with Quantet can offer this programme inclusive of all the additional courses within the set levy fee. The cost of the 2 year training programme is £9,000. However, members with funds in their levy can use this to fund training for their own employees. Those members who have used their levy or who are not levy payers can still access the training as Quantet can access 90% of costs through government funding. The fee to these members for the 2 year programme would therefore be just £900. The next programme will start in October 2018. Please contact info@mds-ltd.co.uk if you have employees who would benefit from developing their management skills and you would like to put them on the training programme. We look forward to receiving your enquiries and to developing the potential for collaborative training. Would you like to work for MDS? We have an opportunity to join the MDS team as Development Manager. This is an exciting opportunity for an individual, committed to driving improvements with the ability to support all levels of staff to meet the agreed standards. Reporting to the Chief Operating Officer you will ensure that members, trainees and training providers are competent to meet current and future requirements. To achieve this, you will review training and development plans, manage training systems and prepare learning and development material to deliver a successful training strategy as well as an ability to improve business practice. 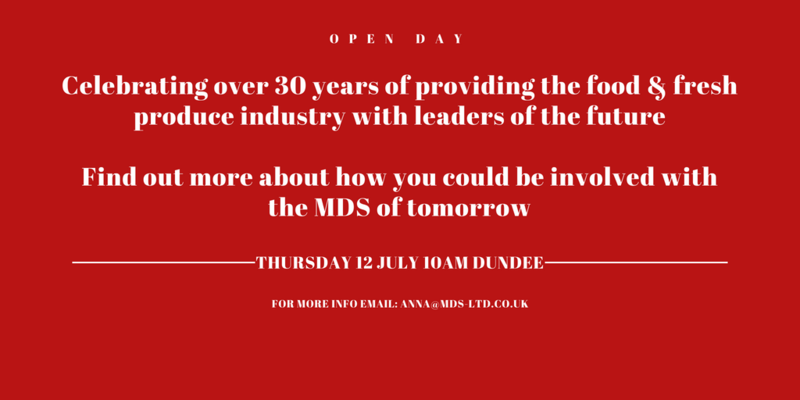 We will be holding an Open Day in Dundee on 12 July, in order to celebrate the work MDS has been doing for over 30 years to bring young talent into the food and fresh produce industry. Speakers will include MDS chair Christine Tacon, John Gray from member company Angus Soft Fruits and two MDS Alumni, Stephanie Brown from Protolan and James Nielson from Greenyard Fresh. If you’d like to find out more about MDS we’d love to see you there. This summer Meet the Trainees will be taking place on the afternoon of 18 June in Grantham. Please contact info@mds-ltd.co.uk for more information. Please note that we are doing some work on our phone lines today (11 April 2018) so you may not be able to reach us on our usual number. If you can’t get through, please try 01733 259 600 or our mobile numbers. The work should be complete by 2pm today so there should be no issue after this time. Our ever popular bi-annual event is back! 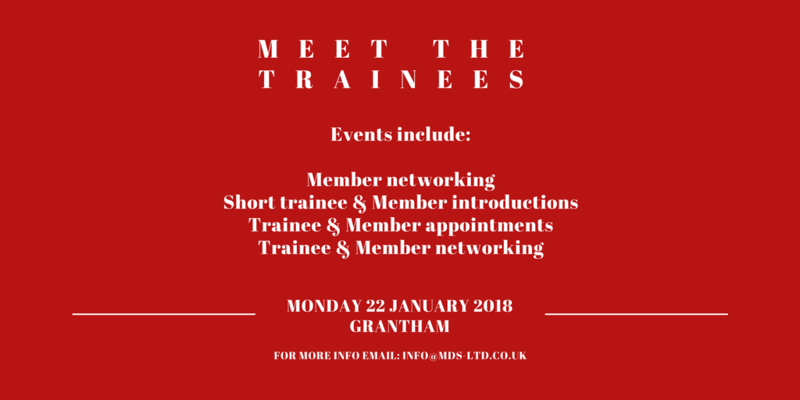 All of the current MDS trainees and many MDS members will gather on 22 January 2018 in Grantham in preparation for Spring 2018 permanent jobs and secondments. Please contact info@mds-ltd.co.uk for more information. If you or your business would like to find out more about how MDS works, what it does for the industry and what it has been doing for it for the last 30 years then please come along to our open day on 16 November in Peterborough (10am – 2pm). Speakers will include MDS members and trainees past and present.